User friendly text and clear illustrations mean that this poster is easy to understand and follow..
Electric hazards are omnipresent in todays work environment. Display this ELECTRIC SHOCK treatm.. 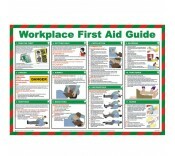 This eye-catching Resusciation of Adults wall chart offers an attractive way to get across impo..
Comprehensive, detailed, with clear text and user friendly illustrations this workplace first aid.. Displaying this safe manual handling poster in your workplace will educate and remind your empl.. Displaying this general Noise at WORK GUIDE poster in your workplace can play an important part i..
Abrasive wheels poster 1.2mm rigid polypropylene H x L: 590 x 450mm .. If you employ anyone you have a legal obligation to display this health & safety law poster i..